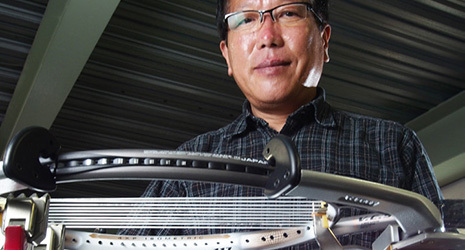 How a small Japanese manufacturer’s racket-stringing machines came to be used in three consecutive Olympic Games. Located in Niiza City, Saitama Prefecture, ToyoZouki Co. is a manufacturer of stringing machines for tennis and badminton rackets. Although it is a small company with just ten employees, the stringing machines manufactured by this enterprise have been designated as the official machines of the 2008 Beijing Games, the 2012 London Games and the 2016 Rio Games. The rackets of top tennis and badminton players are usually strung by experts called stringers. Skilled stringers are assembled from many countries for major tournaments. Different players ask for different types of strings and for different levels of string tension, and occasionally racket strings are even changed mid-game. Since stringers are required to be able to string a racket quickly and accurately, they naturally demand reliable stringing machines. ToyoZouki was founded in 1973 and initially manufactured stationery and office equipment such as staplers and hole punches. in the late 1970s, Tsuchida happened to see a steel tennis racket that one of his friends had brought to Japan from the United States and came up with the idea to manufacture steel rackets himself. At that time, wooden rackets were still the norm in Japan and steel rackets were unavailable domestically. Subsequently, the steel rackets that Tsuchida completed after one year of trial and error were sold by a leading sports equipment manufacturer. Soon however fiber glass and graphite rackets came into play, putting an end to the manufacture of steel rackets. Faced with this difficult situation, Tsuchida came up with the idea of manufacturing stringing machines. At that time, there were tools for stringing rackets, but no machines for them existed in Japan. Stringers did the work entirely by hand, and inevitably different stringers produced different tensions of strings. Tsuchida was also aware that racket and string manufacturers appointed a few master stringers for product performance tests. Tsuchida repeatedly attempted to manufacture prototypes while considering the feedback from stringers and racket manufacturers, and in 1984 he launched the first model. Tsuchida has continuously made improvements ever since, and the 15th model of his machine was officially used in the 2016 Rio Games. ToyoZouki began exporting its stringing machines in 2004 and they are currently being sold in more than twenty-five countries in Asia, Europe and the United States. Each costs about one million yen, making them two to three times more expensive than the stringing machines of other manufacturers. However, they are said to be ten times as durable as conventional models and also boast a variety of user-friendly features. For example, the machines’ voltage is adaptable from 100 V to 240 V for universal use; there are three starting switches for a smooth start, even in the event that one switch malfunctions; and they can be easily set up in just 15 minutes.